Being proficient in analysing data to develop actionable insights is one skill that will be applicable to any digital marketing job you get. Not to mention, it will give you the attention of senior decision makers, by being able to understand and prove wins/losses in their businesses. Put simply, it will make them love you! 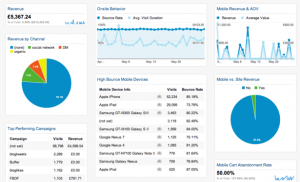 A couple of months back I wrote about accessing analytics data via mobile devices. While this article was largely focused on the lack of a Google Analytics app on the iPhone (and suggested some alternatives to use in its place), a stronger underlying theme to the article was the importance of accessing pertinent data in a quick and efficient fashion. 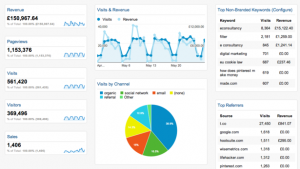 Using Google Analytics custom dashboards is a great example of how you can do this today. Google Analytics Dashboards provide you with a number of fully customisable widgets, that you can use to build a dashboard that serves as a one stop shop for whatever your business/senior decision maker classifies as important data. I strongly recommend that you utilise them, in fact why not try building one including all of the important data that your boss is always asking you about? This way, you’ll win some brownie points with him/her and also free up the time spent nagging you, allowing you to focus more on your day-to-day activities. As an alternative to building your own dashboards, you can also import pre-made ones. I’ve scoured the web and provided my top 6 dashboards below, including links that will allow you to import them straight into your own Google Analytics accounts. With a couple of tweaks these should then be ready to go. Enjoy! One of the most fundamentally important aspects of any brand that has presence online, is understanding when your brand is being mentioned and the actions coming from this. Not only would I advise putting preventative methods in place to recognise and control whenever negative sentiment is shared alongside your account, I would also advise monitoring how strong your brand presence is online. This dashboard is invaluable for the latter. It’s so useful, this dashboard was even mentioned before on State of Search. For a large amount of businesses if you’re not present on social media channels then I can bet your customer is. No matter what extent you’re actively conducting social media activity it’s incredibly likely that social networks will be providing referral traffic (and maybe even conversions!) on your site. 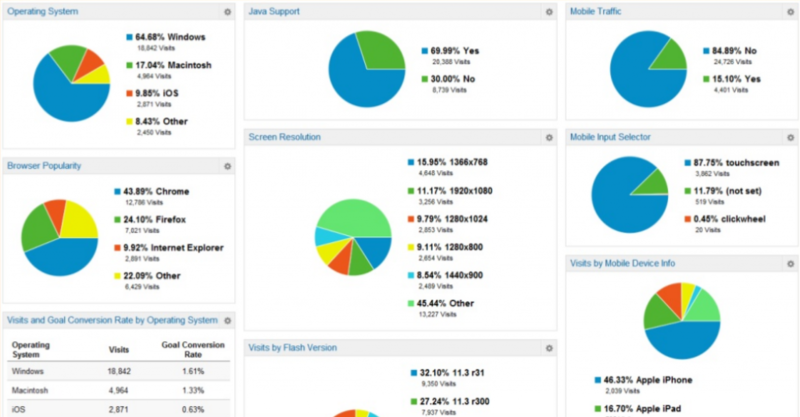 Utilise this dashboard to understand what interactions are coming from social channels. Working for a leading international fashion retailer, data is absolutely paramount to our activities. What is even more evident is that many of my seniors are less interesting in visitor figures, and how many people are accessing the site using iOS e.g. splitting hairs, when it comes down to it they are mainly interested in the money being generated such as revenue figures. This dashboard is a fantastic resource for quickly understanding all of the important metrics in one place! I’m an SEO, and am constantly getting asked for even the most straight-forward SEO metrics. 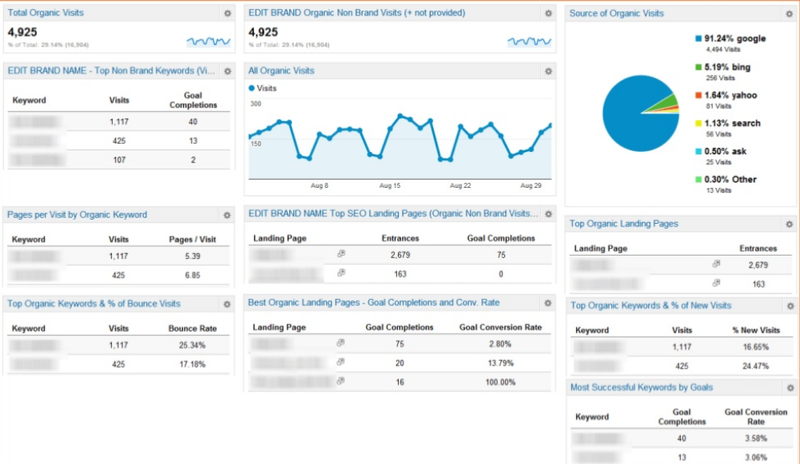 Save yourself time and effort by installing this SEO dashboard to your Google Analytics account. Whether technically minded or not, if you work in digital marketing, it’s very likely that at some point you have to have technical conversations with a variety of stakeholders. While this dashboard won’t teach you the difference between your HTML and DOM’s, it will allow you to understand the technology that your visitors are using on your site. This provides multiple benefits if you’re in-house, agency-side or even a small business using a freelance web developer, allowing you to understand the impact and importance of proposed changes. Viability analysis for future technical releases – I have used top level data from this dashboard to help inform the scheduling of technical changes to a site. Understanding whether or not, and to what extent users are accessing using certain technologies can help inform technical decisions, prioritising based on actual data from your site visitors. 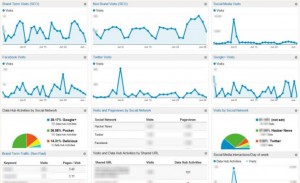 So there you have it, 6 juicy custom dashboards for you to install in you Google Analytics accounts and all it takes it 6 clicks of your mouse. What are you waiting for? Go install them now, and free up your own time to focus on more important things! A big thanks to Koozai and Portent for their Analytics genius and for creating and sharing these awesome dashboards! You can also find a number of top Google Analytics Dashboards, searchable by analytics solution, business objective and/or marketing function on in Google’s Analytics solutions gallery. Great post Ned, always good to have a few more dashboards set up and ready to go, thanks! Thanks Laura! Really glad that the dashboards will come in handy. Good Tip: is to use those I’ve mentioned above (tweak them a little) and get them installed on your clients GA account. It’ll be like giving them a new pair of glasses, and will definitely help to increase their awareness and interest in SEO (if this is a problem that you’re struggling to communicate). Need to try these out! Thanks Ned. Dashboards are great for clients if they actually go into analytics every now and then but like you say they are useful for internal teams. Its always good to be able to show an organisation the value of your marketing work through easy to view statistics. Have you noticed when econsultancy release a post, a bunch of other like posts spring up all over the place. I have tested all the above dashes and they are identical to the ones listed on econsultancy a week ago. Guys, does anyone use a dashboard to monitor all active campaigns among multiple accounts? I’m not sure if this is possible within GA. You may need to use an app like Cyfe to handle that. Yes, I use SeoHighLighter.com to monitor all of my sites.